The payment of refund will be made to your bank account directly by German authorities. Always available locally in India to answer any queries. First and only Trusted service provider in India. References available on request. No additional international courier cost of sending documents to Germany. You need to send documents within India to us and we take care of sending application to Germany. 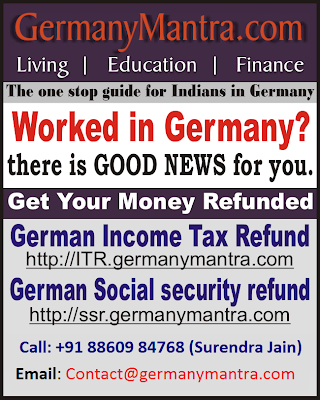 Money is refunded directly to your Bank account by German Tax office giving you complete peace of mind. This is unlike other service providers who get refund into their account and make a cut of upto 16% from refund. We charge Flat fee irrespective of refund amount. Interested, click here to contact us.